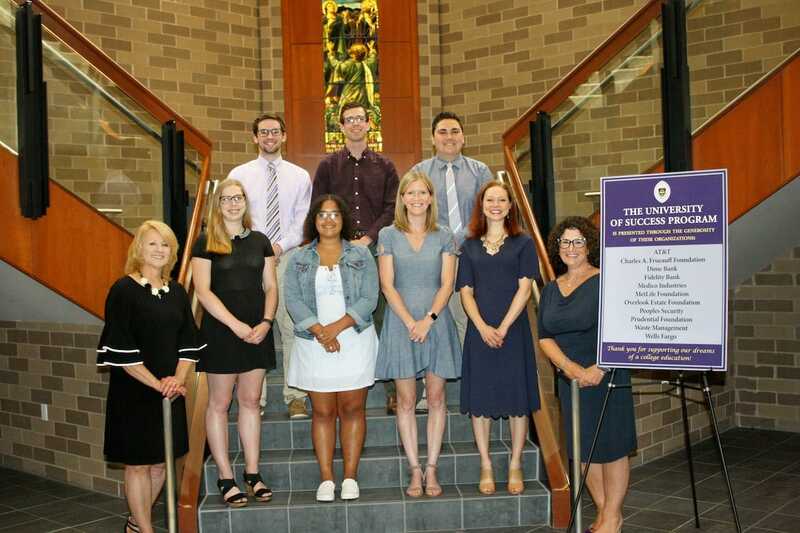 Twenty-two students from a dozen high schools participated in The University of Scranton’s University of Success summer institute, which introduced students to the four-year mentoring program and included hands-on projects, presentations and field trips. Front row, from left: Maria Vital, operations manager at the Leahy Community Health and Family Center; Andrea Mantione, D.N.P., director of the Leahy Community Health and Family Center; Mahnoor Sami, Adriana Gentle, Ritu Regmi, Mayra Suely and Margaret Loughney, University of Success program director. Second row: Rebecca Coldwell, Andrea Murphy and Victoria Scarpati. Third row: Mikayla Mendez, John Edgardo Velazguez, Emily Kogan and Shane Frank. Fourth row: Corey Ortiz, Cailou Kaneski and Jordan Traver. Fifth row: Quiyan McClain, Yeraiza Pena, Samuel Anthony Loukopoulos and Elisha De Souza. Back row: Pavel Vorozilchak, Liam Misko, Logan Matone and Anthony Diaz. 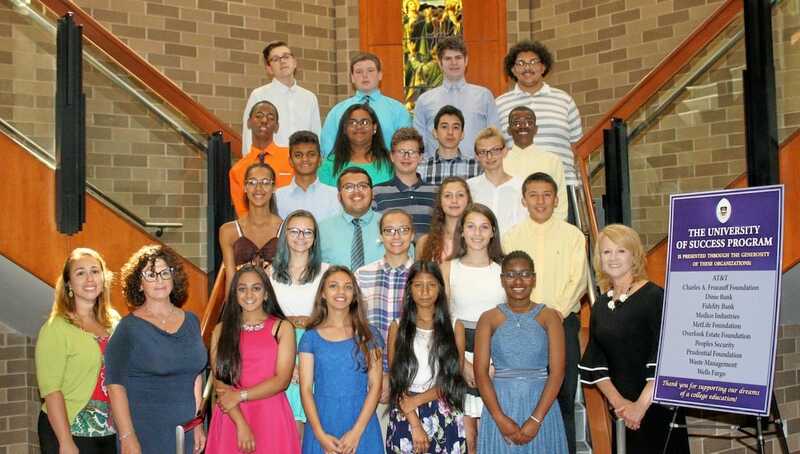 Twenty-two rising high school students entered The University of Scranton’s University of Success program. The four-year, pre-college mentorship program began for the new participants with a two-week summer institute, which took place on the University’s campus in July. During the summer institute, students participated in “hands-on” physics classes where they learned how physics is applied to harness wind energy, as well as for amusement rides that included a day of roller coaster riding at Dorney Park. They learned about exercise physiology and visited the University’s Loyola Science Center for a lesson that included live turtles, tortoises and a snake. The students participated in service projects at the St. Francis of Assisi Kitchen and the Children’s Advocacy Center. They also visited the Lackawanna Coal Mine Tour at McDade Park and the Pocono Environmental Education Center. The students from 12 area high schools will return to the University’s campus one Saturday every month throughout their four years in high school. The University of Success is designed for students to develop the skills needed to successfully gain acceptance to college. Students enter the program at the completion of the eighth grade and continue through their high school years. The program offers enrichment courses in study skills, SAT prep, public speaking, math, science, art and cultural activities, as well as financial aid and wellness seminars. Pavel Vorozilchak of Blakely, who will attend Valley View High School. First row, from left: Margaret Loughney, University of Success program director; Brianna Lawrence, head counselor; Krystine Jimenez, counselor; Erin Shumbres, lead teacher; Kelly Judge, assistant teacher, and Andrea Mantione, D.N.P., director of the Leahy Community Health and Family Center.. Back row: Patrick Chapman, counselor; Joseph Stella, counselor, and Jacob McDonnell, assistant counselor.